On Easter, I shared with you two cards I had made for my children for Easter. I was up until about 4 am the night before, and for a little while, I made cards. I hadn't made any since November or so, so I was itching to get creating! This card was pretty simple to make. I just took a 8.5" X 11" piece of white cardstock and cut it down to 5" X 4.25" and folded it in half. I then stamped on the girl from BC Dzyns - Heart Breaker located here in Memento Dew Drop ink in Tuxedo Black, that I had gotten for free for having an order over $50. I got the stamp set on sale and it's still on sale! So if you're interested, grab it! I stamped the sentiment in the same Tuxedo Black ink. 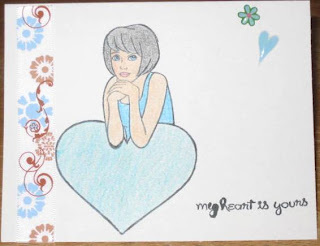 For the girl, I colored her and the heart in with colored pencils. I tried to get the heart to match the ribbon better, so I used three different colors, teal blue, blue, and grey. I added some coordinating ribbon and some acrylic stickers in the top right corner. Easy Peasy! Thanks for stopping by to check out my creation!